The DASH National Program Office developed this informational guide to provide an overview of common terms used when discussing health care data to promote a shared vocabulary across sectors. 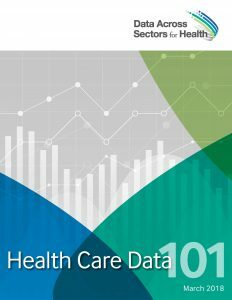 Given the diversity and complexity in health care data systems, this guide serves as a starting point for non-health sector professionals who want to further investigate the health care data available in their local communities and consider how to best leverage it to tackle priorities identified by multi-sector partnerships. Who collects and uses health care data? What are some common types of health care data? How is health care data stored and what systems are used to store it? What are typical uses of health care data? How can different organizations access health care data? What data are available in my local community? Data from the health care sector is essential to understanding and improving individual health and can inform the planning and development of population-level programs and policies in many sectors. Understanding the scope, power and limitations of health care data is a critical starting point in creating data-driven improvement initiatives. Take this survey to provide input on the guide, including what was most and least useful and what you would like to see in future editions. Join the conversation by adding your questions and insights to the discussion forum about this resource guide on the All In online community. Register for an upcoming All In webinar, Using Electronic Health Data for Community Health, to hear case studies of communities that have shared data between health systems and public health agencies and receive guidance from experts in this area. Sign up for the All In newsletter to learn more about projects that share data across sectors to improve health.